National Plug In Day was celebrated on a rainy Friday in Carbondale, Colorado. More than two dozen people from the community showed up to hear a presentation on plug-in vehicles highlighting their environmental and economic benefits. 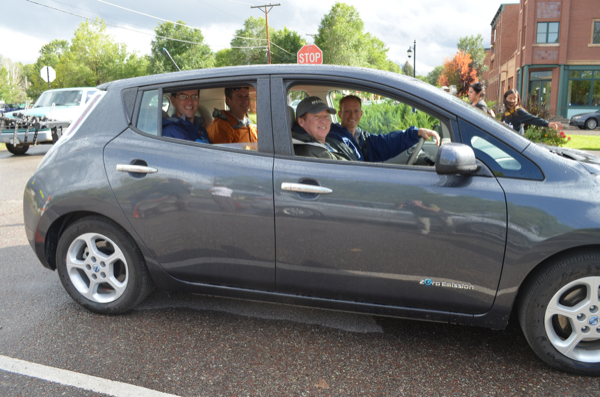 Attendees were treated to free pizza and test drives and rides in two Chevy Volts, a Ford C-Max hybrid and a Nissan Leaf. The vehicles were brought to the event by Mountain Chevrolet in Glenwood Springs, Mike Ogburn from CLEER, and volunteer Craig Farnum. The event was a huge success despite the weather and some attendees suggested it should be repeated monthly.